Christakis and Fowler mined data from the Framingham Heart Study, a massive epidemiological study of heart disease risk. In this sample, they identified nearly 1400 friendships and showed that these friends were, on average, more genetically similar to one another than they were to strangers in the sample. This average statistic, however, masks a subtler pattern: friends were more likely than strangers to share some genes—a phenomenon called “homophily”—and also somewhat less likely to share others—or “heterophily.” (Neither of these should be confused with motownphily.) So, friends diverge genetically from strangers in opposing ways—mostly similar but also sometimes dissimilar. The figure above is a stylized example of this pattern. The green curve represents the average similarity over the genome of randomly paired strangers in the population and the blue curve is the average similarity of pairs of friends. The average pair of strangers is no more similar to one another than you’d expect—the peak of the green curve falls along the midline of the horizontal axis, which is neither similar nor dissimilar. For every pair of genes that is more similar than you’d expect, there is another pair that is more dissimilar than you’d expect. 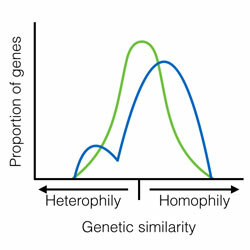 Friends, however, differ from strangers on average by being more similar for many genes and by being more dissimilar for a smaller handful of genes—the blue curve stretches beyond the green curve on both sides (homophily and heterophily). As you can see, most of the difference lies on the homophily side of the figure, which is why friends can be more similar than strangers in general, despite also being more dissimilar on occasion. These findings (and earlier ones reported here) raise two interesting questions: (1) why and (2) how do we do genetically assort our relationships? The first question is a truly fundamental one in the history of evolutionary biology, so it’s this one that I’ll answer in today’s post. And I’ll do it in this snappy video! Hopefully, this video gives you a sense of why humans and other species might have evolved to assort genetically. In the next post, I’ll aim to show you how we do it. Cover image by Guillaume Paumier. Older PostBillionaires Are People, Too!